Over the last week, I have gotten off work a little later than usual causing me to also be later picking up my daughter from daycare. So, on Friday March 25, I decided to get off early to pick up my daughter. I arrive at her school then walk sheepishly into her class. I stand there a few seconds observing her at play. She turns around and lets out a great big gigantic “DADA…DADA” that is only over shadowed by her ear to ear Ronald McDonald like smile. She seemingly excerpts every ounce of energy to run in a full tilt all out sprint to Dada as I hold out my open arms. We hug. I gather her things then we make our way to the car and we are off to home. We arrive at home; I pull into the drive-way, park the car and we get out as usual. Now, as we walk to the door I hear this sweat angel let a devil like screech “DaDa” then she runs hurriedly to me with her arms in the pick me up right now, at this very moment position. I respond in that concerned parent voice. “What’s wrong baby” I reply. Then I make a quick scan of the front yard and see a small figure moving toward the bushes. Now with my angel firmly wrapped in my arms, I walk slowly toward the front door. I look back and forth using CIA like technique to spot the visitor tucked neatly in between the rose-bush planted by the front door. The object of fear was earth tone brown with a brownish fluffy tail. 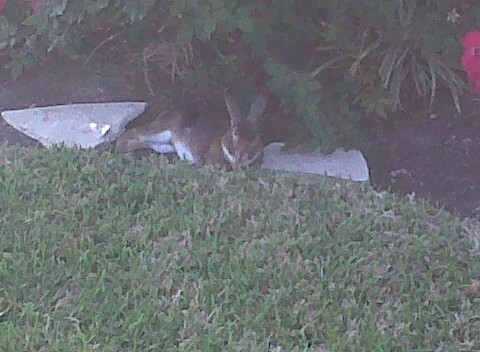 It looked just like Peter Rabbit from the story books. We walk closer and I calm down my terrified angel. I explain to her there is no reason to be afraid and she calms down slowly. She goes into an observation mode. We take a look at the rabbit for a bit than go in the house. The weekend comes. Every morning and afternoon the visitor rabbit shows up. He gets to our house in the morning hours than camps out underneath the rose bush. As the sun sets he moves his location to the shrubbery closer to the house for more shade. 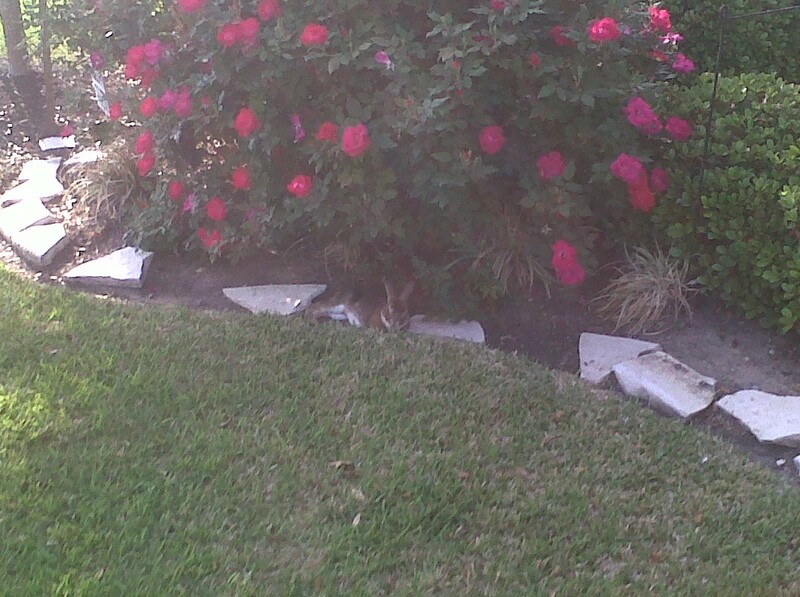 The next week begins and ever since that first encounter with Peter Rabbit it looks like this visitor continues to show up under the rose bush when we get home after work. 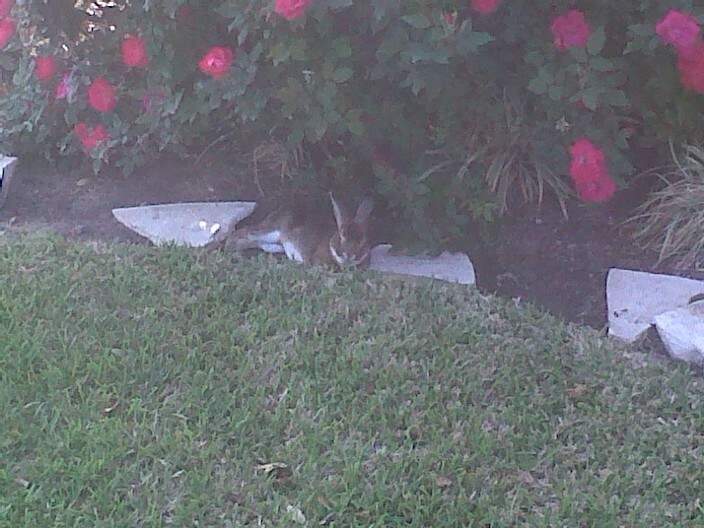 So, eight days later, this rabbit has taken up residence at my house. So with Easter coming up I wonder. Will we have our own personal Easter Bunny? Maybe a few eggs too. 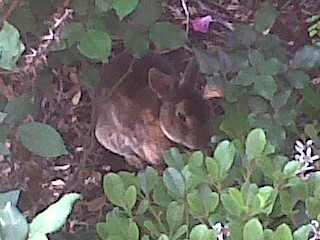 Maybe a little Rabbit Stew? Just joking. Please no calls from PETA. I Love Easter…and the Bunny.